Geckos are types of lizards to be sure, but they are a specific variant that has a number of characteristics distinct from others in their species. In fact, the many unique characteristics of geckos might as well make them an entirely different species, as you will see in this comparison article. Geckos are lizards that belong to the Gekkonidae family. Ranging in size from small to average, these lizards live in places with warm climates. One of the most distinctive characteristics of geckos is their unique vocalization, and this is in fact what gives them their name. Geckos make these sounds in order to interact socially with others of their species. At present, there are as many as 2,000 different species of geckos that have been identified, making the Gekkonidae family the largest of the lizard species. More impressive still, it is thought that there are as yet many other species of gecko waiting to be discovered. The term “lizard” refers to a large group of squamate reptiles, and geckos are only one of them. There are currently almost 3,800 species of lizards that have been identified, and they can be found all over the world with the exception of Antarctica. Lizards are actually closely related to snakes, although they belong to an entirely different group within the broader monophyletic group, in which both lizards and snakes belong. 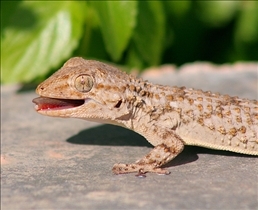 One distinctive physical characteristic of all geckos with the exception of those belonging to the Eublepharinae family is the absence of eyelids. In place of eyelids, geckos instead have a transparent membrane covering their eyes, which they clean by licking them periodically. There are also several species of geckos that expel malodorous material and feces when they are attacked or provoked. Geckos also have the ability to cling to even the smoothest and most vertical of surfaces, and many have taken up semi-permanent residences in homes in tropical countries. And since geckos feed on pests such as mosquitoes, bugs and flies, their presence is generally tolerated in these homes. Unlike snakes, lizards have limbs and external ears. Aside from this physical characteristic however, there is no single distinguishing characteristic of lizards as a group. Many species of lizard also have the ability to detach their tails as a means to escape capture, although not all lizards have this ability. Most lizards also have extremely well-developed eyesight and color vision, and there are in fact several species that communicate via patches of bright colors on their skin. Lizards also have the ability to communicate with each other by giving off and picking up pheromone signals. Lizards can range in size from a few centimeters, as in the case of geckos and chameleons, to almost three meters long, as in the case of the Komodo Dragon. Geckos typically feed on insects such as beetles, millipedes, crickets, and cockroaches. Some of the larger species of geckos have also been known to feed on mice, small birds, and even other lizards. 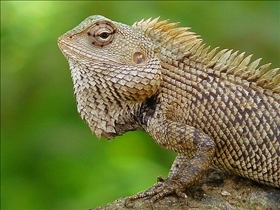 In addition to these, most other types of lizards feed on fruits, vegetation, and even carrion. Which reptile is more numerous in the tropics? This two kind of species are very interesting.Geckos and lizards have lots of differences and similarities as well.But as an organism in the ecology biodiversity has never been new.Maybe becasue of time and natural occurences and changes maybe they could undergoing regeneration process also as other fauna do.Just like recently,a couple woke earlier this year in rural Lee County, SC to find their automobile mauled and bent. Local legend has it the Lizard Man of SC, who apparently terrorized a teenager back in 1988, has come back, and he means business. I read this here: Mauled car might hail the return of the Lizard Man.